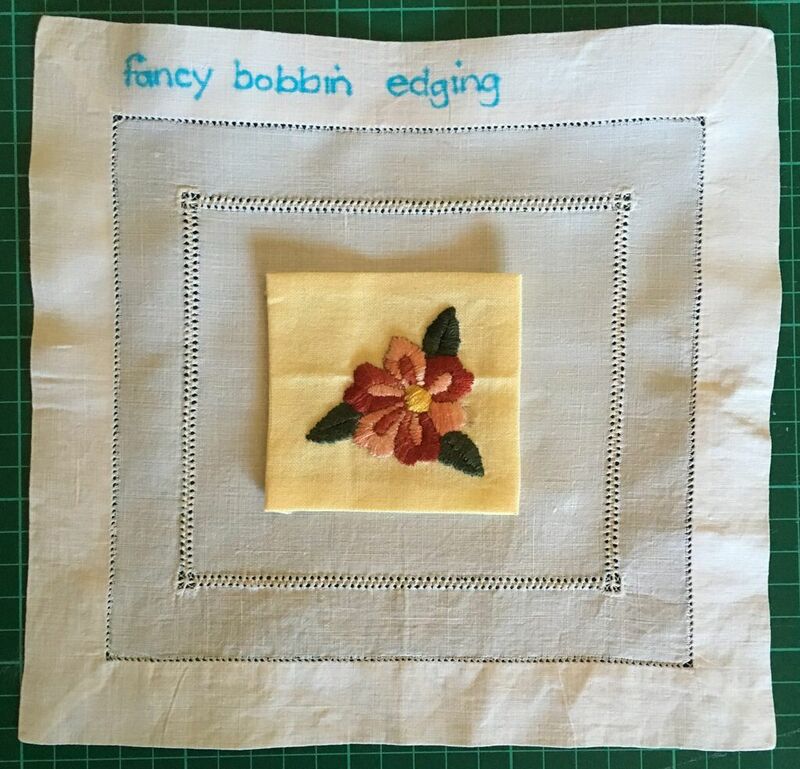 Whilst I’m not behind in my embroidering for the Take a Stitch Tuesday challenge, I am very late in blogging about them! Today’s stitch (from about 3 weeks ago), is up and down buttonhole stitch, and as usual, I got totally carried away with it. In fact, I ended up with three finished samplers. I also tried lots of curves and circles, variations on the leg lengths and directions, beads and couching. Then I thought it might be interesting to try it as a filling stitch on an evenweave linen. I buy almost all of my materials from the local op shops (charity thrift stores), so I have a lot of different fabrics to try. I really love the triangles and the boxes with diamonds in them but boy, do they take a long time to stitch! Finally, I tried some circles on some spotty fabric. I think the ones with three rounds of stitching are my favourite and it’s nice finding a use for some of my Spoonflower samples. If I remember to take a photos, tomorrow I’ll post about stitches 56 and 57! 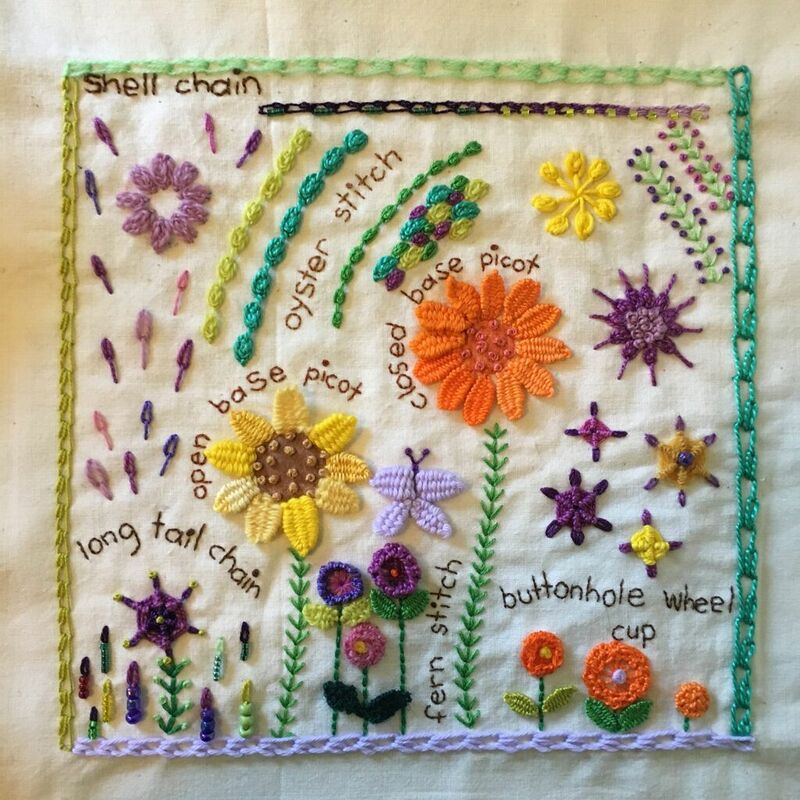 This week’s stitch for the Take a Stitch Tuesday embroidery challenge is knotted buttonhole band. It ended up being quite a versatile stitch, which I wasn’t expecting. I worked the top three rows first, which you can probably see as the purple band on the right of the title is quite a mess, but they do get progressively neater! 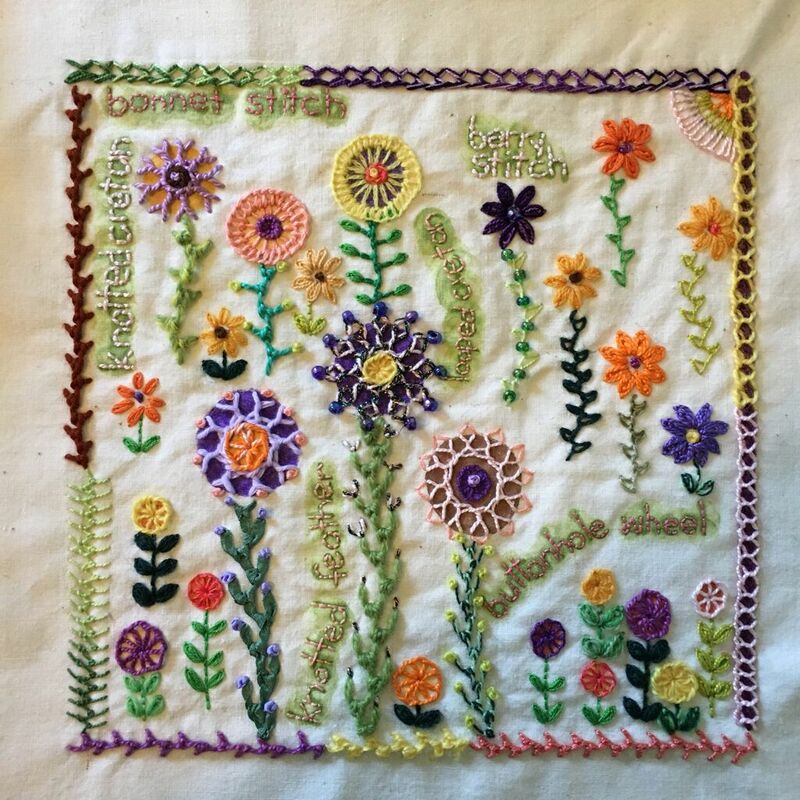 I Googled a lot when I found out about this stitch because I didn’t particularly like the look of it and I wanted to see what other embroiderers had done. The first thing to catch my eye was the spiral worked by Queeniepath on Queeneie’ Needlework. I really liked it at the point where she had worked the knotting along only one side so I tried that in the centre and on a wavy line at the bottom. I really like both and will definitely be using it that way again. I think the wavy line would look really nice if it was mirrored to create a line of lozenges. Knotted buttonhole band with Portuguese border down the centre. Finally I stitched a band with two strands of sewing thread. Couched the ladder threads down with three rows of running stitch. Then I thought I’d go against everyone’s best advice and try a bulky wool/silk knitting yarn with no twist whatsoever. (For the knitters: It’s Noro something or other that I found at the op shop). I think it looks very 70’s. Whipped and woven on the same band. The ladder threads are couched down with cross stitch. I worked a few treatments on this band. I made a french knot in every diamond created by the cross stitches, then every second diamond, then worked a small running stitch at the centre of each cross stitch. And last but not least, I wove a ribbon over 2 ladder stitches, then under 2 and stitched boxes in on the ribbon with large and small stitches! My background is a little different this week as well. It’s the same unbleached calico I’ve used quite a lot but I soaked it in water and painted it with fabric paint. Then I sprayed it with more water so the paint would bleed. It was quite drippy when I hung it up, but the end result was worth the mess. I can’t wait to see what stitch Sharon has for us next Tuesday! 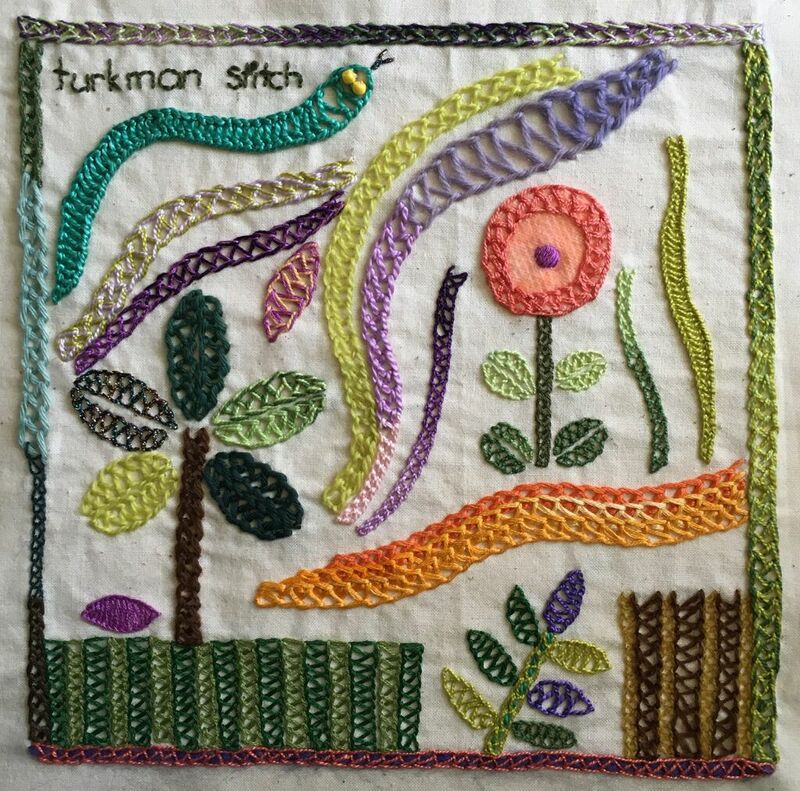 “BORING!”, was my first thought when I saw this week’s stitch for TAST was Turkman stitch. I was wrong. Whenever a new TAST stitch is released, I google. Then I head for Constance Howard’s Book of Stitches, which I mentioned yesterday. 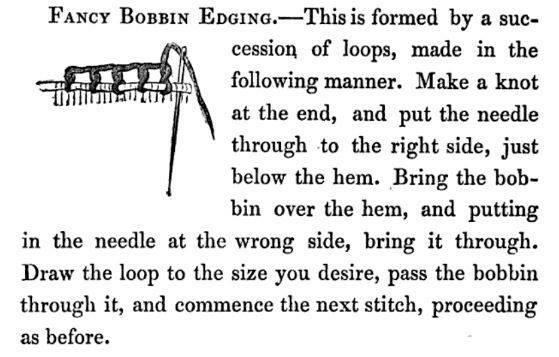 Stitching in a circle. I appliquéd a piece of wool felt with two strands of perle cotton to make a flower (you may have noticed flowers are my go-to motif). Making the stitches smaller on the inner side of the circle made it easy to keep it looking neat and tidy. Layering. In the orange section you can see that I layered three rows of turkman stitch on top of each other. I think this gives a lovely rich effect that can be used to make a lovely gradient filling. Taking tiny little “bites” of fabric with each stitch to make a dense braid-like effect. I used this in the snake, and the lime line on the right hand side. 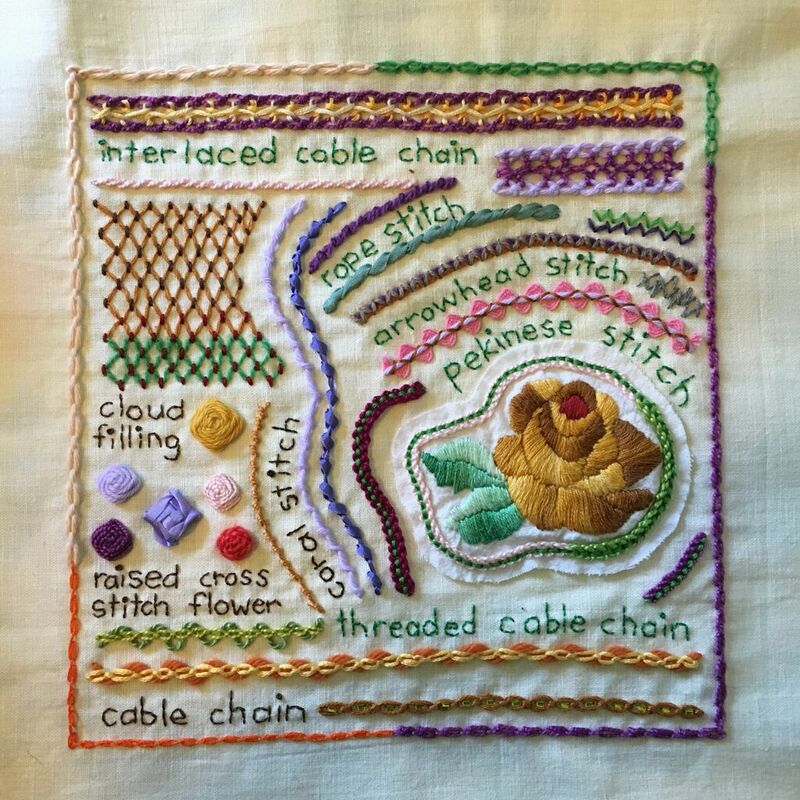 Stitching inside a shape. As you can see, I made a lot of leaves with all sorts of thread. Changing the width of the lines. In an abstract pattern this gives a nice sense of movement, and is also great for stitching snakes! I also tried a few things off the top of my head. Couching of course. I love couching and if a stitch looks like it will work, I’ll try it. You can see my line of couching along the bottom border and in the stem of the sapling/leaf thing. Both are stitched with perle cotton. I thought it might make a nice striped filling so I tried two versions. One with stripes of the same thickness worked with three strands of embroidery floss, and one with thin and thick stripes stitched with a single strand of Appleton Wool. As always, I tried lots of different threads from tapestry wool and cotton, all the way to flower thread, sometimes with two colours held together, sometimes just one. The only threads I wasn’t keen on are the really thick tapestry threads that are meant for working needlepoint. I think everything else works really well. Next week’s stitch remains a mystery (at least until Tuesday), but I have prepared this sampler for working on when I have spare time. I’m going to work it, then stitch it to a background fabric so I can add it to my finished book. and the version worked flat from The Batsford Boom of Embroidery Stitches by Anne Butler (that’s a link to the book on Abebooks.com. I highly recommend the seller “WorldofBooks” as I’ve purchased from them a few times and they’re the only seller that is selling it for what I consider a reasonable price). Hopefully my inability to make fancy bobbin edging look decent is just a matter of different brains preferring different ways of working it. Either that or this is going to be a really crappy sampler! Last week’s embroidery stitch for the Take a Stitch Tuesday embroidery challenge (TAST) was sheaf stitch, which you can see in the top 2/3 of my sampler. 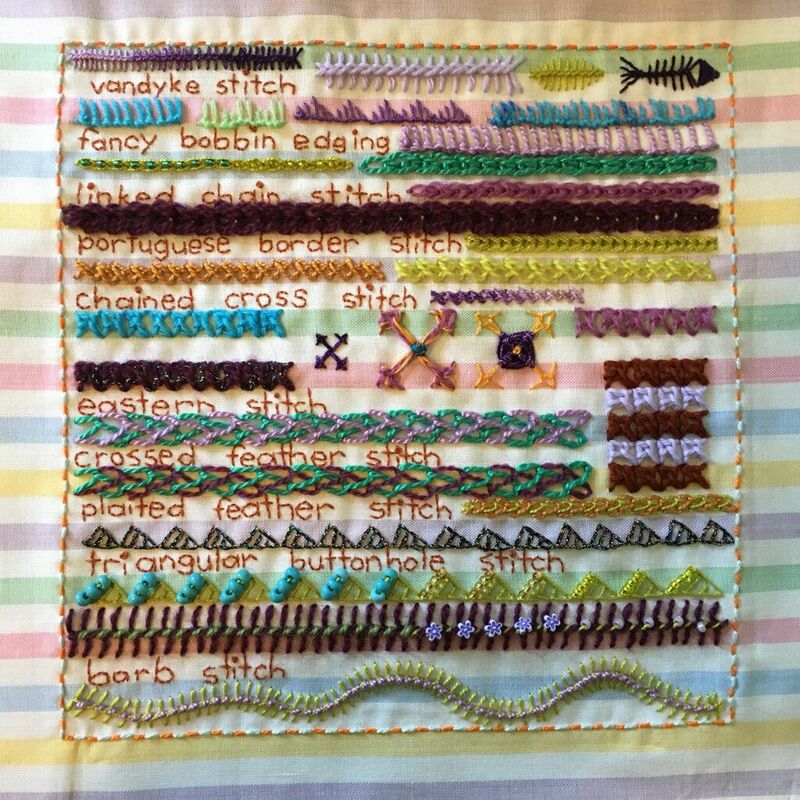 I wanted to try as many things as possible with this stitch, so I had a look at Constance Howard’s Book of Stitches and drew some of the ideas from there, then stitched in as many different threads as I thought would work. I really like all of them, but I think my favourites are using it as a filling and in different shapes, especially the half arch shape. 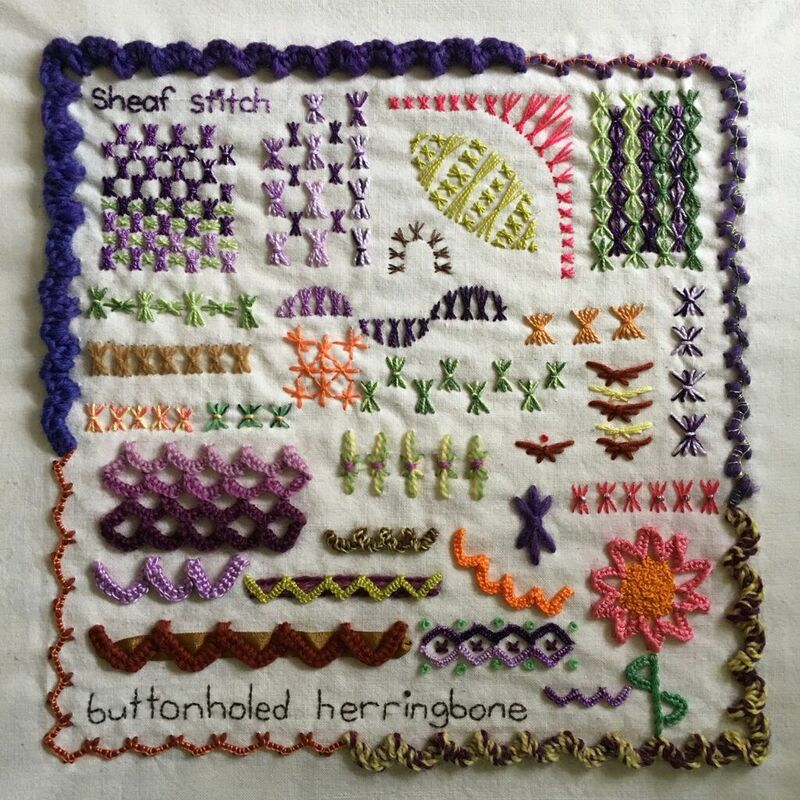 I finished off the border with some more buttonholed herringbone in various knitting yarns and two strands of DMC crewel wool in yellow and purple. This may be last week’s stitch but I haven’t gotten behind yet! Tomorrow I’ll post this week’s sampler, which I finished this morning.